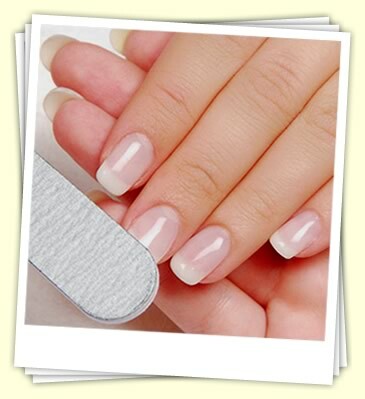 All nail treatments are finished with a colour polish or a French polish free of charge. Soak, file, cutile treatment, hand and arm massage, polish. Soak, file, cutile treatment, hand and arm massage, exfoliation, mask, paraffin wax heat treatment (excellent for aching joints), polish. Soak, shape, moisturise & polish. Cut, file, cutile treatment, hard skin removal, exfoliate, foot and leg massage, polish. Cut, file, soak, cutile treatment, hard skin removal, exfoliate, foot and leg massage, foot mask, paraffin wax heat treatment (excellent for aching joints), polish. Using a blend of essential oils this pedicure is the perfect way to get fabulous foot and nail care with the added bonus of an aromatherapy treatment. Great for those tired achimg feet. This treatment boasts all of the nail and cuticle care needed to get the nails looking wonderful. The Feet and legs are then exfoliated and massaged with the aromatherapy oils. All this is finished with a nourishing foot mask to leave them feeling light and relaxed. Ease those aching foot and leg muscles with a relaxing massage or choose to have an invigorating massage to aid circulation and lymp drainage. A light and soothing massaging that can be aimed to relax or uplift the body and mind with the use of essential oils. A deep tissue massage to help ease tight muscles and break down tension knots. A wonderful combintion of massage and scalp care. This treatment consists of a scalp massage and scalp brushing to ease tension in the scalp whilst the treatment oils nourish. Using a body brush and exfoliating mitt we exfoliate the skin to aid the circulation and remove any dead skin cells. A great pre-holiday or tanning treatment. Foot cleanse, body exfoliation by body brushing & body moisturising. Choose from a relaxing or an invigorating Indian Head Massage. This treatments helps to relieve stress and tension from the head, neck and shoulders using techniques from across the globe. Cleanse, tone, exfoliate, mask and moisturise. A great starter and all round facial. Includes: double cleanse, tone, exfoliate, massage, mask and moisturise. Our therapists will create a facial choosing essential oils to suit you and your skins requirements to leave you feeling fabulous. This treatment is a great way to help reduce those fine lines and wrinkles, helps bust those bags and reduce dark circles...a great pre party treatment or just a little pamper for those tired eyes. INCLUDES HAND/ARM MASSAGE AND MINI EYE TREATMENT Aimed at quenching your skins thirst. Ideal for those tight feeling skins. Leaves your skin glowing and re-hydrated. INCLUDES HAND/ARM MASSAGE AND MINI EYE TREATMENT An intense nourishing treatment ideally suited to dry and flaky skins. An excellent post holiday treatment to boost dry/dehydrated skins. INCLUDES HAND/ARM MASSAGE AND MINI EYE TREATMENT This anti ageing treament helps to regenerate the skin and help reduce fine lines and wrinkles, whilst boosting hydration levels of the skin. INCLUDES HAND/ARM MASSAGE AND MINI EYE TREATMENT Aimed at red, angry or sensitive skins. This treatment leaves the skin strengthened and redness reduced. Why not add on: . Great for party's or special occasions. Can last from 3-7 days. A real treat for the eye area. This treatment is aimed to reduce puffiness and fine lines whilst trying to combat any dark circles. Great for tired eyes. All of our pamper packages are designed to give you time to unwind and leave you feeling totally pampered. Ideal to treat yourself or a loved one to a little relaxation. Start your pamper session with a Luxury manicure and Luxury pedicure, then continue the bliss with a Luxury facial and an eyebrow shape, finishing with a Swedish back massage to complete your pamper session. The ultimate VIP pampering session that is designed to leave you feeling fabulous! This wonderful package includes a VIP Deluxe manicure, a VIP Deluxe pedicure, a Specialised Facial, an eyebrow shape, a Sea Salt Body Glow treatment and a Swedish Body Massage. This package also comes with a complimentary lunch and refreshments.